Sickle cell anemia (SCA) is a debilitating disease characterized by a chronic ongoing hemolytic anemia, punctuated by acute episodes, and chronic organ damage. The global burden of SCA is estimated to be 20–25 million individuals and 12–15 million of them live in Sub-Saharan Africa. Hemoglobin (Hb) S is a mutation of the HbA. This mutation is found in the beta-globin chain and involves a substitution of the hydrophilic glutamic acid for hydrophobic valine at the sixth position. On deoxyribonucleic acid, there is a sequence substitution from Guanine-Adenine-Guanine toGuanine-Cytosine-Guanine (the second nucleotide of the sixth codon-exon one). The HbS is more unstable than HbA, and this instability leads to oxidative stress in SCA by the following mechanisms. The HbS releases its heme easily. The released heme undergoes autoxidation 1.7 times faster than HbA forming meth-HbS that precipitates onto the inner leaflet of the red cell membrane., Free heme within the cytosol repels deoxy-HbS driving them toward each other and accelerating polymer formation. Chelated and membrane-bound Fe3+ acts as a Fenton's reagent and together with hydrogen peroxide generates hydroxyl and peroxides. From ongoing intravascular hemolysis, sickle erythrocytes liberate up to 30 g of cell-free Hb daily. This liberated Hb generates superoxide, peroxide, hydroxyl radical, and hydrogen peroxide about thirty times the amount generated by HbAA individuals., Increases in concentration of reactive oxygen species (ROS) increase malondialdehyde (a reactive naturally occurring organic compound used as a marker for oxidative stress), decrease glutathione levels, reduce levels of enzyme cofactors such as zinc and copper, and promote lipid peroxidation.,,, However, the red cell is not the only source of ROS in SCA. In SCA, a chronic inflammatory state occurs from a constant recruitment and activation of leukocytes and monocytes. Neutrophils on activation demonstrate an increased oxidant production invivo. To demonstrate this effect clinically, we assayed the total antioxidant (a surrogate marker for oxidative stress) in a group of steady-state SCA and explored the relationship between ROS production and leukocytosis. Approval was sought and received from the Oyo State Research and Ethics Committee of the hospital (AD 13/479). Sixty-one adult HbS patients in steady-state and (60) healthy adult HbA blood donors from the Oyo State Blood Bank as well as volunteer medical and nursing staff were recruited, and informed consent was obtained from all participants. Steady state was defined as having no blood transfusions in the previous 4 months and the absence of acute episodes of the following: infection, vaso-occlusive crises, acute coronary syndrome, stroke, priapism, and acute splenic sequestration at least 1 month before inclusion in the study. Interviewer-administered questionnaires were given. The questionnaire obtained information on sociodemographic characteristic, clinical history of chronic leg ulcer, frequency of blood transfusion, admissions, fever, and infection. Five milliliters of venous blood was drawn from the antecubital fossa, out of which 3 ml was put into potassium ethylenediaminetetraacetic acid bottle to be used for full blood count (FBC). The 2 ml of venous blood for antioxidant assay was drawn into a plain bottle and allowed to clot by standing for 60 min at room temperature. The serum was decanted using a plastic pipette. The serum was used to run serum total antioxidant status after storage for 3 months at −20°C. The peripheral FBC was determined using Cell-Dyn 1200 hematology analyzer (Abbott Diagnostics, North Chicago, IL, USA). The serum total antioxidant status was performed using an enzymatic colorimetric method from Randox Total Antioxidant Status NX2332 (Randox, UK). Student's t-test was used to compare the mean of total antioxidant status. Simple percentages were used to describe clinical characteristics of patients. Correlation testing was carried out using the Pearson's correlation test on total antioxidant status and FBC. 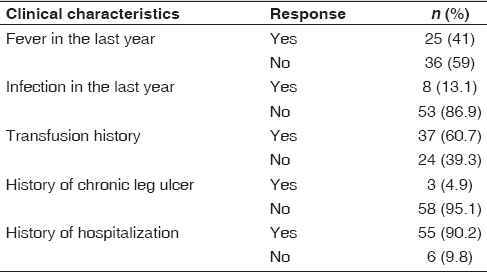 Clinical characteristics of patients revealed that 90.2% of the patients had been hospitalized in the past 1 year, while 60.7% of the patients had been transfused in the past [Table 1]. The patients had a significantly lower antioxidant status compared with controls. The mean total antioxidant status for SCA patients was 2.6 mmol/L compared with 4. 6 mmol/L for the controls (P = 0.004). The median value and the range for both the sickle cell patients and the controls were 1.60/L V4.0/L and 17.80mmol/L V 15.60mmol/L respectively. There was a significant inverse relationship between total antioxidant status, total white cell count, lymphocyte count, and platelet count. 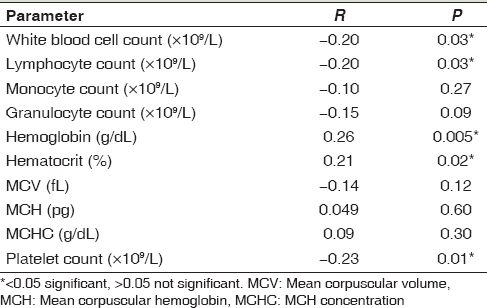 A direct relationship between total antioxidant status, hematocrit, and Hb concentration was observed as shown in [Table 2]. Total antioxidant status did not show any significant relationships with any of the studied clinical features. ROS are formed as a by-product of metabolism. Without the balancing effect of antioxidants both enzymatic and non-enzymatic, these ROS will attack cell components resulting in oxidative stress. ROS are not only produced by the HbS but also by activated leukocytes as a side effect of the persistent chronic inflammatory state in SCA patients. We postulated that increases in leukocytes will be associated with oxidative stress. In this study, we compared the total antioxidant status of SCA with controls. We investigated the relationship between leukocyte cell count and differentials, clinical status of SCA participants, markers of oxidative stress, and total antioxidant status. The total antioxidant status of patients was 50% less than the control group, a finding observed by several investigators.,,, Fasola et al. found that the total antioxidant status of the SCA group was half than that of controls. Al-Naama et al. found that a direct marker of oxidative stress, serum malondialdehyde, was twice the level found in controls. Gizi et al. in their study noted that the total antioxidant enzyme levels in patients with SCA were decreased and oxygen radicals were three times higher that found in controls. El-Ghamrawy et al. discovered that total antioxidant status was significantly lower, and malondialdehyde was significantly higher in patients with SCA. These clinical studies corroborated our findings and show that there is uniform evidence that total antioxidant status is significantly lower in SCA compared with AA controls. There was a significant inverse relationship between total antioxidant status, white cell, and lymphocyte count. This was corroborated by Fasola et al. who found a significant inverse relationship between total antioxidant status and total white cell count. Total antioxidant status reduces as white cell counts increase. Neutrophils generate an oxidative burst, which produces free radicals that are required to destroy microbes. Leukocytosis will increase free radicals formed thus outstrip the body's capacity to neutralize them. There was a significant direct relationship between total antioxidant status, Hb concentration, and hematocrit. Al-Naama et al. explained this phenomenon by stating that intravascular hemolysis (which result in anemia) induces oxidative stress through the release of cell-free Hb. The cell-free Hb forms a stable complex with nitric oxide and iron which is a Fenton's reagent involved in Fenton's reactions. Reticuloendothelial macrophages also increase their erythrophagocytosis as a response to oxidative stress, thus reducing the hematocrit/Hb concentration. Al-Naama et al. and Fasola et al. observed that the serum total antioxidant status of the respondents with a worse clinical course was significantly lower than those with a better clinical course using frequency of crises as the indicator. However, in this study, there was no relationship between total antioxidant status and clinical features. A possible explanation is that the sickle cell population used in Al-Naama and Fasola's studies have different disease modifiers from those used in this study. Those modifiers may ameliorate clinical symptoms of the disease to a larger extent. This study corroborated the study of some investigators that oxidative stress is significantly more in SCA compared with healthy controls. Aliyu ZY, Tumblin AR, Kato GJ. Current therapy of sickle cell disease. Haematologica 2006;91:7-10. Aliyu ZY, Kato GJ, Taylor Jt, Babadoko A, Mamman AI, Gordeuk VR, et al. Sickle cell disease and pulmonary hypertension in Africa: A global perspective and review of epidemiology, pathophysiology, and management. Am J Hematol 2008;83:63-70. Ballas SK, Kesen MR, Goldberg MF, Lutty GA, Dampier C, Osunkwo I, et al. Beyond the definitions of the phenotypic complications of sickle cell disease: An update on management. ScientificWorldJournal 2012;2012:949535. Queiroz RF, Lima ES. Oxidative stress in sickle cell disease. Rev Bras Hematol Hemoter 2013;35:16-7. Islam MS, Chia L. Hyperhemolysis syndrome in a patient with sickle cell disease with erythrophagocytosis in peripheral blood. Eur J Haematol 2010;84:188. Uzunova VV, Pan W, Galkin O, Vekilov PG. Free heme and the polymerization of sickle cell hemoglobin. Biophys J 2010;99:1976-85. Test ST, Woolworth VS. Defective regulation of complement by the sickle erythrocyte: Evidence for a defect in control of membrane attack complex formation. Blood 1994;83:842-52. Sparkenbaugh E, Pawlinski R. Interplay between coagulation and vascular inflammation in sickle cell disease. Br J Haematol 2013;162:3-14. Al-Naama LM, Hassan MK, Mehdi JK. Association of erythrocytes antioxidant enzymes and their cofactors with markers of oxidative stress in patients with sickle cell anemia. Qatar Med J 2015;2015:14. Gizi A, Papassotiriou I, Apostolakou F, Lazaropoulou C, Papastamataki M, Kanavaki I, et al. Assessment of oxidative stress in patients with sickle cell disease: The glutathione system and the oxidant-antioxidant status. Blood Cells Mol Dis 2011;46:220-5. El-Ghamrawy MK, Hanna WM, Abdel-Salam A, El-Sonbaty MM, Youness ER, Adel A. Oxidant-antioxidant status in Egyptian children with sickle cell anemia: A single center-based study. J Pediatr (Rio J) 2014;90:286-92. Fasola F, Adedapo K, Anetor J, Kuti M. Total antioxidants status and some hematological values in sickle cell disease patients in steady state. J Natl Med Assoc 2007;99:891-4. Te19wari S, Brousse V, Piel FB, Menzel S, Rees DC. Environmental determinants of severity in sickle cell disease. Haematologica 2015;100:1108-16. Wandersee NJ, Hessner M, Pritchard KA, Hogg N. Neutrophil activation in sickle cell disease: Biochemical and functional changes at baseline and during acute vaso-occlusive crises. Blood 2013;122:992. Ballas SK, Lieff S, Benjamin LJ, Dampier CD, Heeney MM, Hoppe C, et al. Definitions of the phenotypic manifestations of sickle cell disease. Am J Hematol 2010;85:6-13.